New OECD composite leading economic indicators suggest that Chinese and Brazilians face disappointment with their economies in the months ahead, while many Europeans, Japanese and Americans may be pleasantly surprised. The new political leadership in Beijing and the government in Brasilia, which faces an election next year, and has already endured widespread street protests about the economy, may have questions to answer from their publics. Conversely, the beleaguered British government, the Obama administration and the German government, which faces its electorate this fall, may take heart. In March and April 2013, the Pew Research Center surveyed 39 nations, asking people whether they thought their economies would improve over the next 12 months. 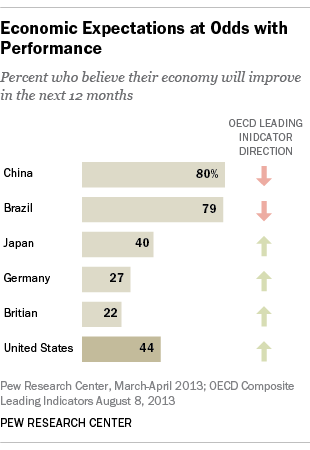 Roughly eight-in-ten Chinese (80%) and Brazilians (79%) were upbeat about the trajectory of their economies. But the OECD expects both these economies to slow in the months ahead. For the Chinese, whose economy grew by 7.8% last year, this slowdown could prove a rude awakening. For Brazilians, whose economy grew by only 0.9% in 2012, slowing growth could prove more troubling. Europeans, Japanese and Americans have more to look forward to. In spring 2013, just 27% of Germans and 22% of the British expected an economic pickup in the short run. But growth is returning to levels Germany enjoyed in the past and is firming up in Britain, according to the OECD. Four-in-ten Japanese (40%) thought better days were ahead and the country’s leading economic indicators confirm that optimism. Even more Americans (44%) saw their economy improving over the next 12 months and growth is firming up as they expected.